MIKE TYSON. IRON FISTED MIKE TYSON BEAT TONY TUCKER TO STAND ALONE AT THE TOP. HEAVYWEIGHT CHAMPION. " KING MIKE! ". A REAL NICE ACTION COVER SHOT OF. SPORTS ILLUSTRATED. AUGUST 10, 1987. THE LABEL HAS BEEN CLEANLY REMOVED. HOFer MICKEY MANTLE on the COVER..
MIKE TYSON. HEAVYWEIGHT CHAMPION. SPORTS ILLUSTRATED. FEBRUARY 1, 1988. THE LABEL HAS BEEN CLEANLY REMOVED. Favorite History. IT FINDS 21 YEAR-OLD. " TOO MUCH! ". All Sports Illustrateds are in excellent to better condition. Have thousands that aren’t listed so if you have a favorite player or team, let me know I probably have some with them on the covers. As always, free shipping! Buy from a trusted seller with flawless feedback and fast shipping. My feedback speaks for itself. Comes from a smoke free/pet free home. Please check all pictures and ask any questions before purchasing. Make sure to check out my other items for sale and to follow me as a seller as I am adding new items daily. Any questions or other photos needed please don't hesitate to ask. Thanks for checking out my page! MIKE TYSON BEATS RAZOE RUDDOCK BY A. HE- AND THE REF STOPPED RAZOR RUDDOCK. CONTROVERSIAL TKO IN LAS VEGAS. MIKE TYSON. MIKE TYSON WAS A STUDY IN FURY AS. "DESERT STORM!". SPORTS ILLUSTRATED. MARCH 25, 1991. IRON MIKE TYSON SPORTS ILLUSTRATED COVER AUTOGRAPH!!!! 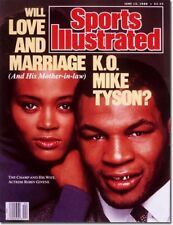 This item is the cover page of the December 1, 1986 Sports Illustrated issue featuring the one and only Iron Mike Tyson! I personally obtained Mike's signature on this cover page at the Press Conference for the Tyson/Thomas Heavyweight title match! 1991 Mike Tyson Razor Ruddock Sports Illustrated Label Removed. Shipped with USPS First Class Package. Very good condition. The pictures should give you a good idea of the condition. Note light finger prints on the covers, water stains on 8 pages, a few pages have tiny tears, and light scratches on the covers. P.S. All magazines are in poly bags with a backing board. Magazines have wear to them. Label cleanly removed. All Sports Illustrateds are in great condition unless noted. Please check picture of Cover carefully. I have priced most issues accordingly but do miss a few flaws. Have thousands that aren’t listed so if you have a favorite player or team, let me know I probably have some with them on the covers. As always, free shipping! Buy from a trusted seller with flawless feedback and fast shipping. My feedback speaks for itself. Comes from a smoke free/pet free home. Please check all pictures and ask any questions before purchasing as there are no returns. Make sure to check out my other items for sale and to follow me as a seller as I am adding new items daily. Any questions or other photos needed please don't hesitate to ask. Thanks for checking out my page! 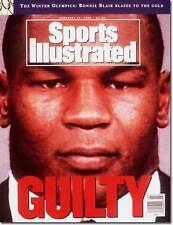 This issue of Sports Illustrated features Mike Tyson on the cover. This is the June 24, 1991 issue. All Sports Illustrateds are in good-excellent condition unless noted. Newer issues are like new. All Sports Illustrateds are in very good-excellent to better condition unless noted. Sports Illustrated Magazine July 22, 1991 "2001 A Fan's World"Co ver. These old back issues of SI have been stacked in a closet for 20-25 years and are in decent shape. They were well read 25 years ago. The pictures should give you a good idea of the condition. Note a few spots, light scratches, and light scuffs on the covers. P.S. All magazines are in poly bags with a backing board. Each of these magazines provide a little flashback into our past and makes a great gift for the serious collector or that special friend. Double Protection - Safe and Secure! Sports illustrated - Mike Tyson Bundle. (55) Sports Illustrated LOT all BOXING ! Muhammad Ali SUGAR RAY Mike Tyson NICE! This is a huge lot of (55) Sports Illustrated mags all with boxing related cover. So much value here! Over a dozens Muhammad Ali mags, (7) Mike Tyson mags, multiples of greats like Roberto Duran, Marvin Hagler, Sugar Ray Leonard, George Foreman, Ken Norton and more! All Sports Illustrateds are in very good-excellent to better condition unless noted. Please check picture of Cover carefully. I have priced most issues accordingly but do miss a few flaws. Have thousands that aren’t listed so if you have a favorite player or team, let me know I probably have some with them on the covers. As always, free shipping! Buy from a trusted seller with flawless feedback and fast shipping. My feedback speaks for itself. Comes from a smoke free/pet free home. Please check all pictures and ask any questions before purchasing. Make sure to check out my other items for sale and to follow me as a seller as I am adding new items daily. Any questions or other photos needed please don't hesitate to ask. Thanks for checking out my page! Lot of 23 issues. Most have a price sticker on them. Average conditon is fine. Cover:Mike Tyson vs. Buster Douglas. Original Sports Illustrated Magazine. Date:February 19, 1990. MAD MAGAZINE #297 / SEPTEMBER 1990 - MIKE TYSON & BUSTER DOUGLAS ON THE COVER. The magazine is in excellent condition. I took many pictures, you can see it has a sharp spine, mint corners, and the pages inside are clean and crisp. Original, real nice condition with no tears or markings. MIKE TYSON. MIKE TYSON KNOCKED DOWN BUSTER DOUGLAS IN THE EIGHTH ROUND BUT THEN. SPORTS ILLUSTRATED. FEBRUARY 19, 1990. A NICE "NO LABEL" ISSUE TO DISPLAY AND/OR FOR GETTING AUTOGRAPHED. HE GOT UP AND. (28) Sports Illustrated LOT all MIKE TYSON ! WoW ! This is a great lot of (28) Sports Illustrated mags all with Mike Tyson covers. The mags are complete and have tight spines, original gloss and display great ! SEE SCAN FOR INDEX SHOWING CONTENTS. THIS ISSUE WITH HAS A GOOD BINDING AND CLEAN PAGES. BACK BOTTOM LEFT COVER IS A BIT DOG EARRED. MIKE TYSON. IS THE FURY GONE?. SPORTS ILLUSTRATED. JUNE 24, 1991. Super "Rare" No Label News-Stand Edition. A NICE "NO LABEL" ISSUE TO DISPLAY AND/OR FOR GETTING AUTOGRAPHED. IT IS A "RARE" NEWS-STAND EDITION, SO THERE IS.